She writes, “As is the case with many construction projects, the bids came back much higher than our budget. 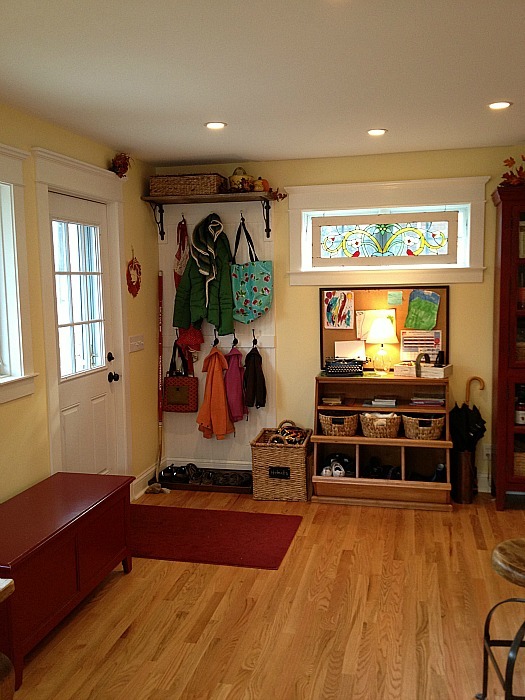 We knew the place we could cut out the most cost was in our cabinetry and counters. We reused our existing cabinets and reconfigured them in the new space, adding just a couple of extras from Home Depot to make it complete. 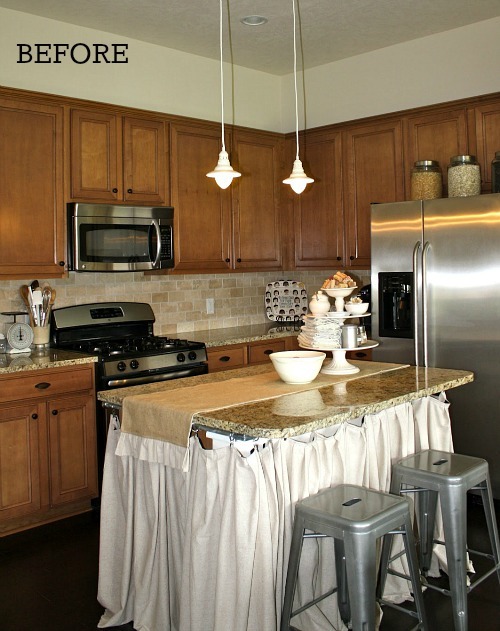 “One of my favorite things in the new kitchen is our island. We used a decades-old wooden workbench that was in our basement when we bought the house. Our carpenter wrapped it with old barn wood from my husband’s family farm to add more stability. Thanks to Maribeth and all my other readers who shared their kitchens with us for my contest. All week I’ll be showing as many of the entries as possible, so stay tuned! I may be a designer, but I enjoy an IKEA kitchen too. They can be the perfect solution when lots of customization is not required. I’ve even installed my own… So easy! The mistake people make is judging IKEA as cheap, so not true. Other than special finishes & custom options offered by high end manufacturers, the interior box is exactly the same. IKEA even uses Blum hardware. These pics show how beautiful and stylish an IKEA kitchen can be. i dont get why ikea is called cheap. Beautiful! I’m planning a kitchen make over too and this is inspiring. I really like the big red piece of furniture they are using as their pantry. Is there a way of finding out where it was purchased? Thank you. Yes yes yes! 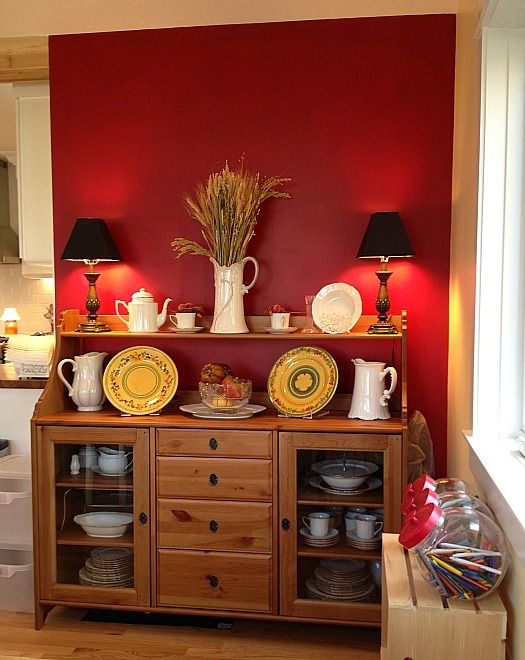 Where was that gorgeous red cabinet purchased? Details, please! I love how they made it more personalized while updating it for their family. I love to use IKEA products in a design when I can because they always keep you within your budget. Plus I just love visiting their showrooms since they’re so inspiring! Thank you for showing us Maribeth’s beautiful kitchen space, I love all the pictures. 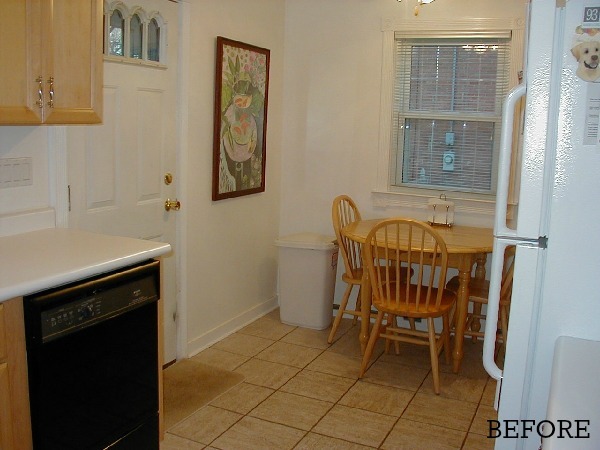 wait, how did you move the stove to a different part of the kitchen? do you have long electric/gas lines? did yout cut glass your existing into the over the sink cabinets or bought those ? you took out a wall where the sink used to be, you dont miss all the cabonites?…thought the open space and island is nice. and where is the microwave ? We actually added on to the back of our house, all three levels, so it was a pretty major project. Kudos to our wonderful architects (Kinglsey & Ginnodo) who came up with the plan for the kitchen and our builders (JRC Design Build) who executed it beautifully (and quickly!). Our old kitchen was gutted in order to add the new space, so moving gas lines wasn’t an issue. I ordered the above sink cabinet from Home Depot to match our old cabinets. You can order them with glass fronts, which is what we did. By adding the island and the furniture piece pantry, as well as the banquette bench that has storage, we don’t miss those cabinets at all! @maribeth: O ok. I didnt know it was a full 3 level addition. iIt looks great. I like the sink, and new positioning. What type of sink is that with the front overlapping thing, what is that called? It’s called a farmhouse sink. They come in all different sizes and finishes with the distinguishing characteristic being the apron front. We priced many different farmhouse sinks and took a leap of faith on the Ikea one after reading many favorable reviews. We have been super happy with it and it is huge! Really love this one !! I have to ask……..where is the microwave? It says that it’s on a cart, but I don’t see the cart. Love this kitchen. What a great remodel! That island re-purposed is just fantastic! Thanks, Nicole! You can’t see the microwave cart in any of the pictures. It’s actually nestled between the red pantry and the refrigerator. We bought the Stenstorp Kitchen Cart from Ikea that has an oak top like the countertops. We used Waterlox to seal all of the wood countertops to give them a uniform sheen. 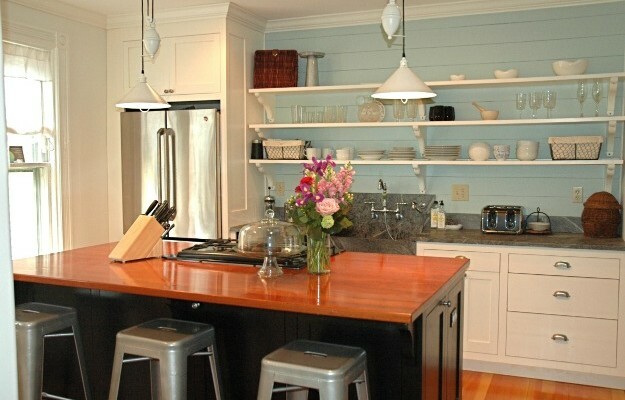 I was literally JUST searching Pinterest for kitchens with these exact cabinets/doors and butcher block countertops. I’ve been waiting for years to save up enough for a custom kitchen re-do and it’s just not going to happen any time soon. I could have had a beautiful IKEA kitchen ages ago. Thanks for featuring this! Good luck with your project, Sue! I LOVE your kitchen. Actually, I think our kitchens could be friends since we also used the Ikea countertops (in a similar finish) and sink and ours is on the cozy side as well. I adore the island, the red pantry cabinet and the comfortable feeling of your kitchen and the overall welcoming vibe in all the pictures! I am sure you have a great feeling of accomplishment whenever you are in this room. Thank you, Rosie! I love the idea of rooms being friends. 🙂 The kitchen is definitely my happy place, especially when my three young kids are eating snacks at the island or we are all playing a board game at the kitchen table. It was well worth all the work! 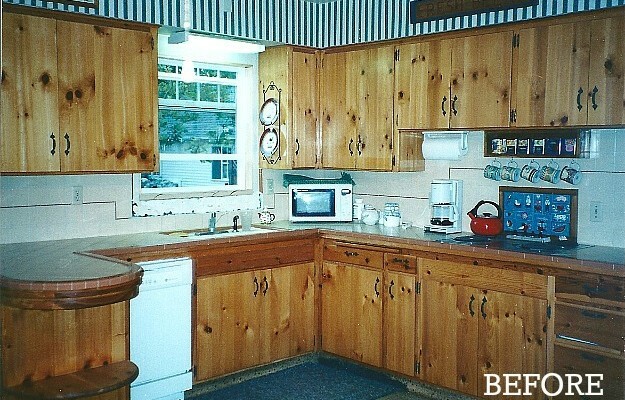 we have the same issues with our kitchen, and are thinking of an addition similar to yours. Our 1950’s surburban cape cod is very small, and we are just starting to think about the possibilities. Thank you for sharing your pictures! Can you give me a ballpark of the cost? Hi Mary! It’s hard to give you a cost for the kitchen because we did an addition that included a basement and an extra bedroom above the kitchen. Also, there is a wide range in cost depending on what you do (knocking down walls and moving plumbing and gas/electric is naturally more expensive than a cosmetic upgrade). A good place to start would be to contact a local builder (there are several established builders in our town that many people use, so we started there). A builder will typically come to your home for a free consultation and give you a very ballpark idea of what you could accomplish and what the cost would be. We saved a ton of money by getting creative rather than going the custom route. Good luck with your project! I love your kitchen. I am wondering where your kitchen table is from? Thanks, Janie! I got the table on Craigslist. I kept searching for Farmhouse Table, and discovered this one. My family of 5 used to sit around a very small semi-circle, so we are in love with our 8-ft. long table! Maribeth your a genius! Your kitchen looks great and all on a budget. I have always loved Ikea kitchens and I love to see one in real life (almost) instead of the store. Maribeth ~ I am planning on using the Ikea wood countertops very soon. Did you caulk around your sink at all? Are they the NUMERÄR Oak? Lastly, how many coats of Waterlox and where did you find it? Menards doesn’t sale it. Lowes/ Home Depot? Love your kitchen!! Hi Melinda! Thank you! We did use the Numerar Oak, and we love it! I have always loved farmhouse sinks, but we strategically bought one to reduce the risk of exposing the wood to lots of water (as a drop-in sink would do). Lucky for us, Ikea has a very reasonable and very durable (and HUGE) farmhouse sink, too. We did caulk around the edges of the sink to seal everything off. I used the VOC Compliant (still has a strong odor to it) Waterlox in the medium sheen. I got mine at a store called Woodcraft, but if you go to the Waterlox site, they should list distributors in your area. We did 4 coats. Hope that helps! 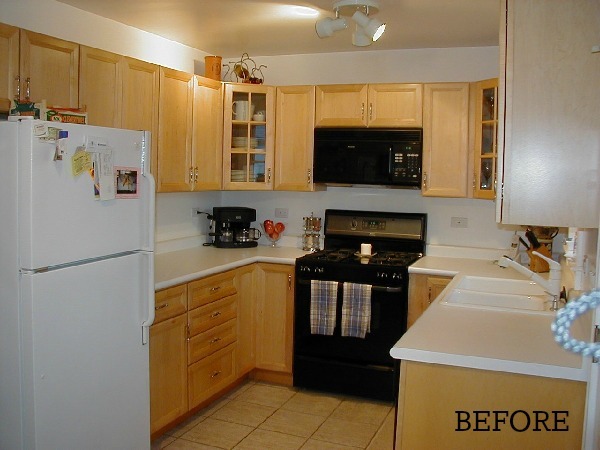 What a fabulous kitchen transformation. Gotta love Ikea! Maribeth, It’s easy to create a dream kitchen when you have a large budget or the help of a designer, but to create this amazing kitchen on a budget — hats off to you! Great job!! This kitchen is beautiful! 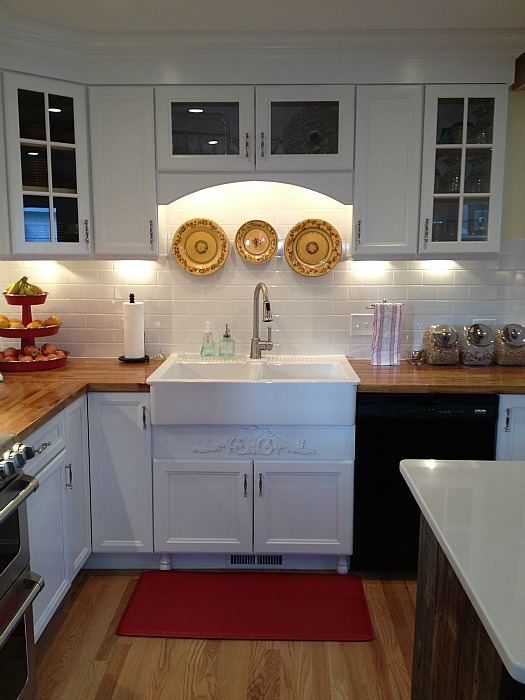 I love the island, and yes, that red cabinet is a great statement piece! Coveting those oak counter tops…it really brings the entire look together! Inspiring! I am looking at custom cabinets, but am wondering if Ikea offers enough options that I can make it work in our tiny space? I’ll check it out. Great transformation. You would never know budget was involved! Kitchen is very pretty but hate the new location of the refrigerator. We are getting ready to put new countertops in the kitchen too. IKEA ones are the ones my husband is going to use. Glad to see them in a done kitchen. It looks terrific. You grabbed me at IKEA! They are definitely not custom. Nor are they high-end materials. But, they are stylish, affordable, well designed and sturdy and have a place somewhere in every home at some time. Those who pooh-pooh them obviously haven’t visited a store lately, or have an unlimited budget. Your kitchen is absolutely lovely. Great job! I visit IKEA every time I get and always buy something (usually WAY more than something – and have never been disappointed). Love everything about this! We’re probably 3-5 years away from a kitchen redo, so I’m dreaming of what I’d change when the time comes. 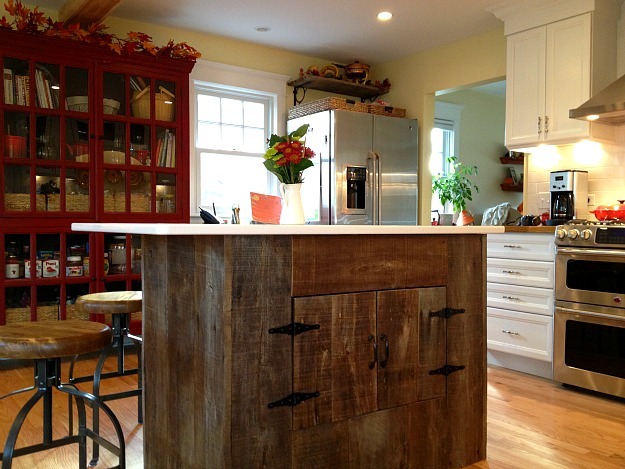 It’s so inspiring to see people with “real” kitchens–not new construction in a McMansion. 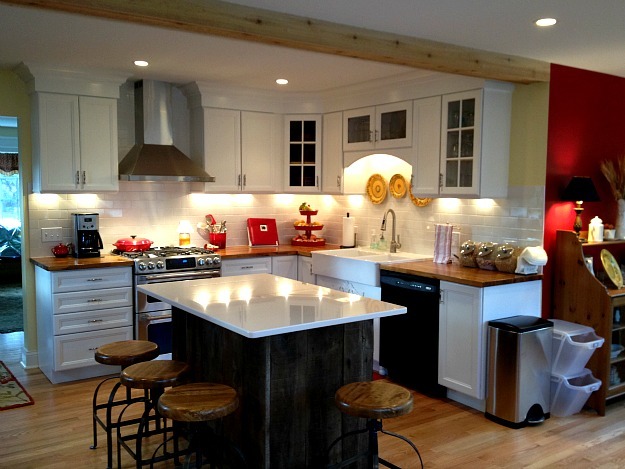 Love the red cabinet, white subway tile and butcher block. I worry about the upkeep on butcher block a bit, but I do love the look! And I love the hooks beside the door. I wish I had room for a similar setup since our main door is our kitchen door (we have a detached garage). Well done! What a beautiful kitchen! I love that the original cabinets were reused. It makes the kitchen feel nice and homey. I love it, so cute!! Do the cabinets you used for your bench have a specific name at Ikea? I love the look and am interested in doing something very similar. What did you put on the top of them? Thanks in advance for any info! Lovely! 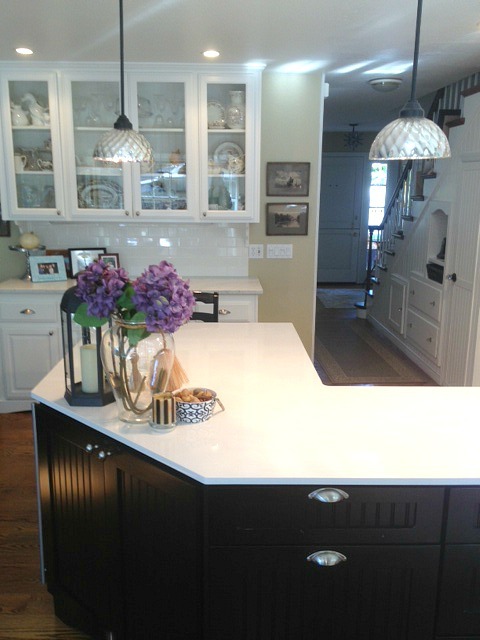 I fell in love with IKEA’s white cabinets w/ this butcher-block counter top last summer. 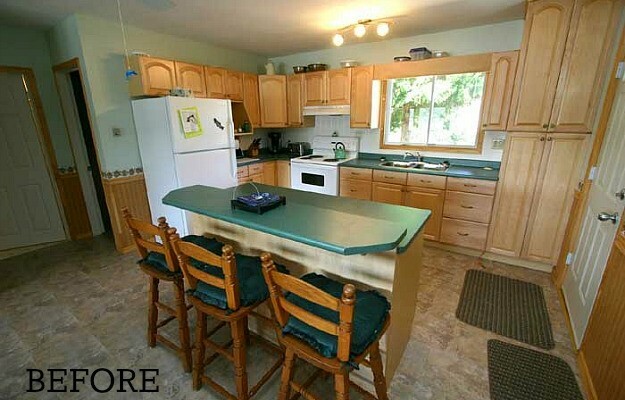 QUESTION: Did you put a sealer on the counter top, or did it come this way? I don’t remember it being this shiny. If you did, can you share what you used. Also, you mentioned IKEA’s microwave cart – was that pictured? My microwave is 30-years-old and will not die! Purchased in 1983 and it is so big and bulky, I keep it in the laundry room. I am finally thinking of getting a small one to put in the kitchen over the double-oven I installed last year, but I wanted to see the cart you used. Well done! Great use of space! I’m inspired! I use a lot of Ikea in my home and have been very pleased with all of it. I have a huge kitchen table (7 ft. I think) that I bought 9 years ago for $300 and it’s still perfectly fine. I have to know where you got that three tiered fruit tray – it is darling! I’m always looking for space savers and am sick of millions of bowls of fruit everywhere! If you can share that would be great! Again – congrats on the beautiful job. i too like the tired fruit tray. But I LOVE cold oranges and peaches. Still Id love to know where fruir tray is from. 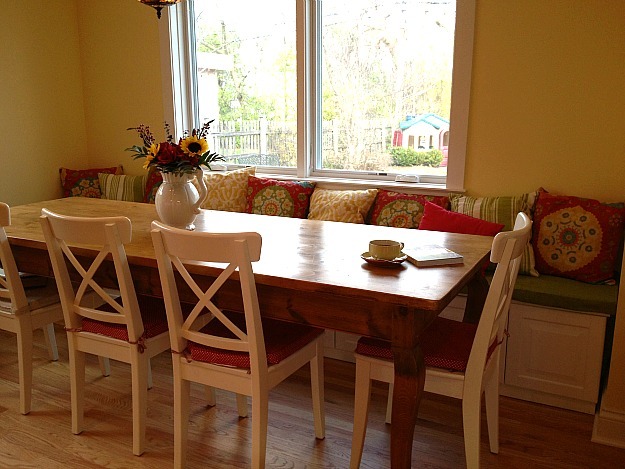 I have to steal some of the “suburban” tricks to bring to my downtown Chicago kitchen-especially the banquette!